At last Orville was free, soaring above the sand dunes, wind in his face. Lying in the glider's wing, he moved his hips in the control cradle and the craft began to turn as planned. But then something went wrong. The glider wanted to go into a spin, and as Orville struggled with the controls, it came to a standstill in midair. 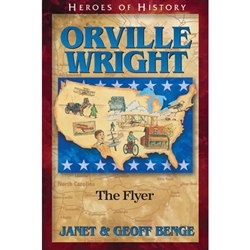 When Orville Wright and his brother Wilbur set out to solve the problem of flight, they recognized that success would come with careful observation, perseverance, and ingenuity. From experiments in their Dayton, Ohio, bicycle shop to test flights over the beaches of Kitty Hawk, North Carolina, the amateur aviation enthusiasts risked their lives and worked tirelessly to solve the problems that had stumped the world's best scientists. Together the Wright brothers designed and constructed a power-driven airplane and, in it, made the world's first controlled, sustained flights. As a result, the skies were opened and the era of aviation began (1871-1948).